We came, we saw, we ran about screaming in the dark. Ok, so we’ve caught up on our sleep, conquered the post-con sugar/adrenaline depression and re-examined in the cold light of day all those module ideas that seemed so inspired in the pub. It’s time for a brief reflection on Xenomorph. 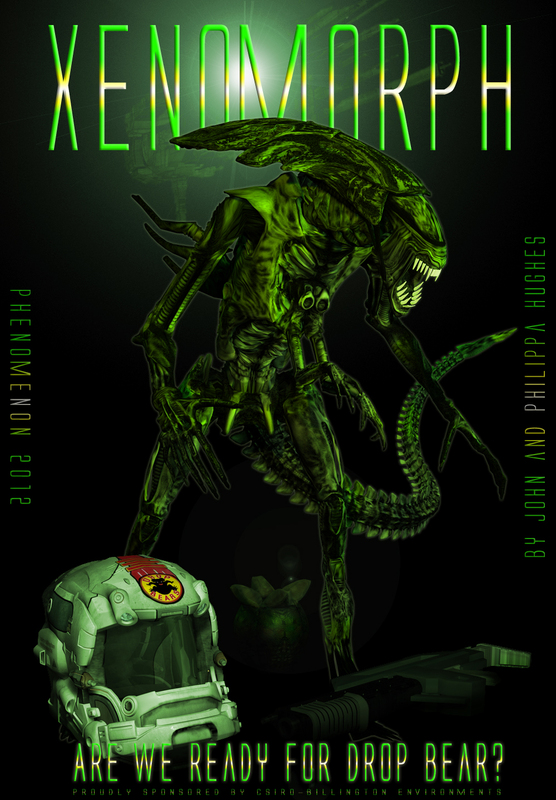 Xenomorph was a single session systemless rpg convention game run at Phenomenon 2012. Written by Philippa and myself, it was intended as roleplaying theatre, a partial re-imagining of a third Aliens movie and a personal homage to the entire quadrilogy. I hope you had fun. I know that we did. First up, thank you players, playtesters, con organisers and volunteers, those of you who costumed up, printed posters, provided lighting, shared lunchtime crits and insights, tiptoed quietly past the dark rooms, and offered support and friendship during the various medical emergencies along the way. I want to add a big personal thank you to Pip as co-writer. As many of you will be aware, Pip has been battling, and beating, cancer over the last two years, an exhausting and painful struggle that has involved multiple hospitalisations, operations and chemotherapy. Pip was in hospital the weeks before and the weeks after Pheno. There were occasions when I wanted to cancel Xenomorph to concentrate on more pressing concerns, but Pip was adamant we keep writing. That we got there in the end was entirely due to her determination and resolve. An Aliens module set as an alternative to Alien3? Where to begin? We started by compiling a list of happy endings from the Aliens movies. (Go on, do it now). Uh huh. That sort of defines the genre. Then we watched the movies for the nth time, (no, not AvP), read the comics and novels, and devoured all the feminist and cinema and genre and philosophical commentary. There’s quite a bit out there: it’s a powerful and pervasive modern myth-cycle. 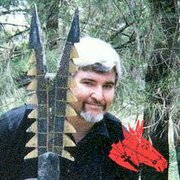 But the marines thing has already been done – most memorably in the late, great Chris Wheeler‘s original Xenomorph, which ran at Necronomicon (the ancestor of Phenomenon) 2 here in Canberra back in 1990, and which introduced the budda-budda-budda resolution system that we acknowledged and stole for our own game. It became rapidly obvious that exploring the essential themes of the Aliens quadrilogy – especially the sexual and generative aspects – wasn’t possible in a single session module. And our story couldn’t stray too far – genre familiarity cuts both ways. In the end we tried to capture a few core themes, and to create a roleplaying palimpsest that acknowledged the greater whole. Ultimately we focussed on two main aims. We wanted to re-imagine and extend the ending of the movie Aliens so that all of the second film’s survivors (Ripley, Newt and Hicks) might live to fight another day. In this we had William Gibson’s (unused) screenplay for the third Aliens movie as inspiration. We also wanted to retain and explore certain elements from the actual Alien3 that we considered insightful and worthy of the progression. The third movie shocked everyone after the adrenaline-rush and narrative drive of Aliens. It negated any lingering survivor optimism through an uncompromising brutality and a concern for character over plot. It also slaughtered all of the main characters – two of them in the opening thirty seconds. Okay, it was a mess, and it went through development hell, but one of the things that Alien3 did very well was its exploration of the themes of grieving for those lost and the burdens of survivor guilt. Those notions provided us with insights we could explore in a systemless game, providing an inner agenda in a genre more associated with marine firefights and scary encounters in dark spaces. (To be fair, a few of those crept in to our module as well). Together with the overt plot element – a return to the spaceship Sulaco – they defined the possibility space for the module: the boundaries within which we could explore the monsters within us, the monsters between us, in our relationships and organisations, and the monsters beyond us, waiting, hungry in the dark. and limb in the echoing steel and resin canyons of the Sulaco. Most tried a little of all three. We only had three hours :). Gameplay was made easier by the fact that the Aliens movies are part of our collective roleplaying DNA. We are all children of Ripley. Players knew the settings well, and had little trouble immersing themselves in the genre and locales, even with the addition of novel elements lika an antipodean megacorp and research station. And the standard of play was uniformly high – some teams had me terrified by their sheer intensity, and depth and honesty of emotion. While Xenomorph was not a cathartic module – there was far too much external happening for that, and the genre itself telegraphs that endings will tend to be bloody and brutal – its overall atmosphere of inter-character suspicion tinged with grief did contain enough elements to dive deep if teams so chose. When it comes to conventions, Pip and I are primarily systemless writers. Our aim in presenting a convention module is to present opportunities which invite (but never force) players to dive into the deeper levels of a story, to challenge them in the ways they wish to be challenged, and above all to provide an experience that is different – something more intense and polished and thought-provoking than your average home game. We always try to build and extend the Australian systemless roleplaying tradition. As writer and GM, I can only review half of any game. Player inputs: characterisation, innovation, action, teamwork, and group play provide many of the key elements that decide whether a game will run successfully. You can’t review a roleplaying game without making explicit what the players themselves bring to it. That said, the mix of traditional strategic play, physical theatre (creeping about down darkened corridors with prop rifles and torches), and character drama/catharsis worked well. Teams could play to their strengths. The mix meant that Xenomorph could not be an elegant module, and it required a lot of gamesmaster and player improv, but it provided an enormous possibility space for play. The characters were members of a security boarding party. They were genre archetypes at their heart: Gould the tired warrior, Crowe the immoral tank, Conrad the grieving Ripley type, Pynne the genius nerd, and Gentle the contradicted corporate. We tried to add depth and an element of against-type surprise while keeping character sheets fairly short. The PCs were all linked through a recently deceased colleague, Wayne Pearson, whose death implicated them all in various ways. The suspicion, paranoia, guilt and grieving around Pearson’s death provided the game’s internal engine. We also provided a visually rich module background, a series of briefings posted to the Pheno Facebook page and to this blog, detailing an antipodean megacorporation called csiro-billington and RSV Shackleton, a science research station. As designers, it allowed us to indulge in a bit of original work and to continue our tradition of telling Australian stories as much as possible. Again, teams that accessed this material before play were able to ease into the module all the more quickly and easily, and it proved a good vehicle for publicity. But was it necessary? No. We used this and other visual material we had created to storyboard the module as it played out, providing visual handouts of NPCs, incidents and backgrounds. As you’ll see from the other sections of Myth-O-Logic, Pip and I are both 3D artists, and creating these illustrations are a very satisfying (if time-consuming) way of building a module. Interestingly, while I also had lots of franchise visuals of Sulaco, xenomorphs, and security types falling before unrushing waves of xenomorphs, I didn’t use them. Players knew the genre well, and the internal movies were already playing in their heads. As so often with our convention modules, Xenomorph found itself hemmed in by a single session playing time. The module was originally scripted in two acts, one on Sulaco and a climax on Shackleton. We had to cut it back to a single act aboard Sulaco. (See the Gibson script for inspiration as to what happens when xenomorphs get aboard a large civilian station). Time constraints are a common problem in our convention modules – we tend to overwrite. The tide has turned against two-session games on the Australian convention circuit, but maybe next time we should just do it. We haven’t done a double session since the early nineties. Perhaps run a mini-con weekend just for longer games? Or maybe just learn to edit down. 🙂 It’s the hardest part of writing. Character-wise, repeat play revealed a few kinks. Pyne was a little too isolated, and his hacking skills a little too god-like. Gentle’s secret and personal crisis was too personal, too private. Without posting spoilers, there were some things she quite literally could not think, could not say. There was some absolutely stunning roleplay by Gentle players working with and around this limitation, alas not entirely appreciated by the other players at the time. Trust me though; I noticed. I remember. Confession time – convention play for me is always a glorious, intense, adrenaline-driven blur. I remember little afterward. (You too huh?) It was made worse, this year, for Pip and I weren’t able to join the traditional debrief at the pub, where key game moments are recycled, set, and sometimes even created. Session notes help for prizegiving, but like, how do you summarise three hours in fifteen words? I’d like to thank players for seeing the potential for Crowe as Zapp Brannigan, and Pynne as Sheldon (‘Open the airlock. Open the airlock. Open the airlock.’) I was also surprised when the resemblance of RSV Shackleton to Canberra Tower was pointed out; something that never occurred to me even though the tower features prominently in the view from my office window. Given the amount of story improvisation necessary once players were aboard Sulaco, I know that some of my gm calls were inconsistent; the nature of the new alien infestation varied somewhat from game to game. Having acknowledged this, I also know its the nature of the roleplaying beast. So there we have it. Xenomorph: messy and nostalgic, familiar in its confrontations, grim as the genre that birthed it. Ripley, Newt and Hick (all quietly in cryo sleep the whole time) were rescued in most instances. Player characters did less well: some survived, many did not. A few escaped amidst the chaos of Shackleton’s collapse or aboard a colonial marines scout ship. Some were cut down, a few found dignity and even resolution of a sort. It’s that sort of universe. We commit our bodies to the Void. Posted on August 19, 2012, in AlienZ, rpg, Xenomorph and tagged AlienZ, Game writing, rpg, Systemless, xenomorph. Bookmark the permalink. Leave a comment.